Ferran 'Coro' Corominas was the star of the show at the Fatorda as his hat-trick saw off a resilient 10-man Bengaluru FC. Coro's brace had put the hosts 3-1 up in the first half after Gurpreet Singh Sandhu was sent off but Bengaluru fought back to make it 3-3 before Coro completed his hat-trick. The game hadn’t yet found a flow to it when Corominas fired the hosts into a lead in the 16th minute. Picked out by Eduardo Bedia, the Spaniard cut in, skipped past a challenge from Juanan Gonzalez and hit it past Rahul Bheke’s outstretched foot and beyond Gurpreet Sandhu as the JN Stadium erupted. But it took just a little more than five minutes for Bengaluru FC to give the 100-odd traveling fans their own little reason to celebrate when Miku scored through Kattimani’s legs in the 22nd minute. The build-up to the goal was typical BFC with Udanta Singh, Lenny Rodrigues and Erik Paartalu exchanging quick passes before the Australian midfielder found Miku with a delicate chip that the Venezuelan put away to make it 1-1. 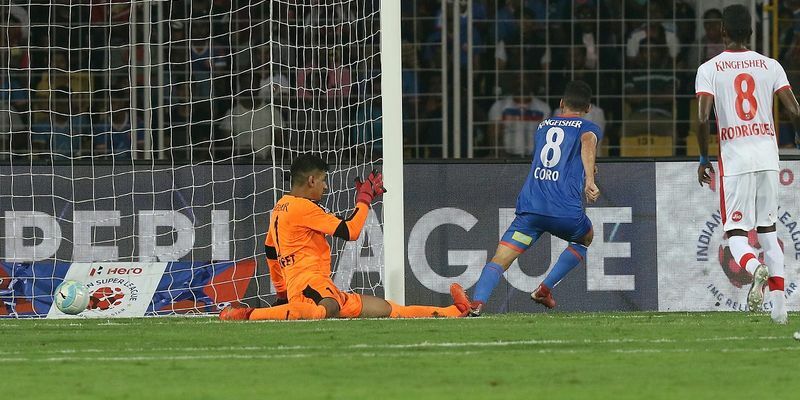 The equaliser infused a new energy to the way Bengaluru went about attacking and Sunil Chhetri came close to handing the Blues a lead in the 29thminute when he stole the ball off Bruno Pinheiro only to see his shot on target blocked by a Goa defender. Just when things seemed to be coming together for Bengaluru, Corminas turned up with his and Goa’s second of the night. A free kick from Goa’s half was nodded down and the Spaniard charged in before slotting home from close in the 32nd minute. Things hit a dismal low for Alberto Roca’s side when Gurpreet was given marching orders for an off-the-ball incident with Manuel Lanzarote. A tussle began when Lanzarote caught Gurpreet with a boot on the ankle and ended with the striker making a meal of a push from the Blues’ ’keeper and referee Palmson Raj pulled out the red before pointing to the spot. Roca pulled off Bheke for Abhra Mondal and the ’keeper’s first task of the night was facing Lanzarote from the spot – a battle the Spanish striker won. With the tide heavily against them in the second half, Bengaluru decided that to swim against it was the only way to stay afloat as Roca’s boys began stitching a brave comeback. Paartalu rose high to nod Garcia’s corner to make it 3-2 in the 57th minute. And then Miku produced a moment of magic in the box on the hour mark to make it 3-3. With the ball at his feet in the box, the No.7 chopped one defender and touched it past another before chipping over an onrushing Kattimani. But Corominas would go on to score the season’s first hat-trick, rounding off Mondal just three minutes after Goa conceded to make it 4-3 to the hosts. Roca threw on Subhasish Bose and Braulio Nobrega, withdrawing Edu and Lenny and Bengaluru continued to attack but strikes from Nobrega and Chhetri were saved by Kattimani. The Blues will now face off against NorthEast United in their second away game in Guwahati on December 8.